Come on, jump in your car! Click here to play! It's time to race away at this classic slot and cross the finish line in the lucrative first position. Enjoy the wonders of a traditional slot coupled with traditional vehicles in this exciting slot machine. 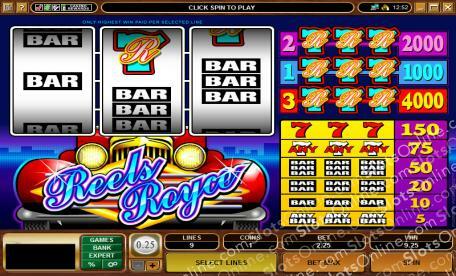 Reels Royce is played over 3 reels and 3 pay lines, with the more lines activated allowing more opportunities to pick up winning combinations. There are no Wilds, Scatters, or Bonus Games, instead there is simply classic gaming on offer all day long. Three coin slots are available to be played before each round, so play them all for the biggest and best payouts on offer. The Reels Royce symbol will earn you plenty of cash if you land three of them on an active pay line, up to 4000 times your initial wager in total! Take this brilliant slot out for a test drive today and return home with cash-lined pockets!